Defend yourself against the enemies and go hunting with a collection of antique weapons. 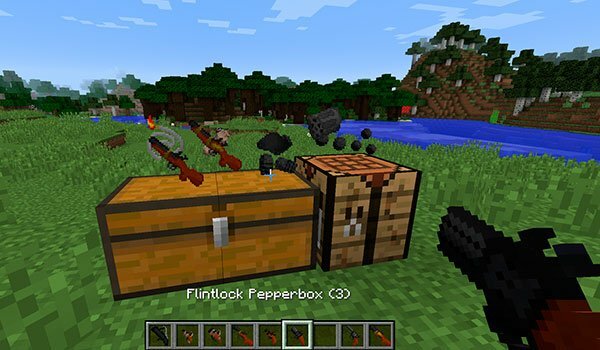 Old Guns 1.8 and 1.8.8 is a mod that will add a collection of antique weapons, which can be used both to defend against enemies, how to go hunting to deep forests of Minecraft. These weapons can be crafting from various parts and combinations. Some of the weapons that we can use are: rifles, muskets, Derringers, shotguns, pistols, revolvers and three types of guns. Remember that these are old weapons, so some of them may lack precision, recharge speed and others may not work very well in the rain. How to install Old Guns Mod for Minecraft 1.8 and 1.8.8? Double click the mod downloaded file to run the Forge installer. You can now use old weapons in Minecraft!